The women’s basketball team earned two State University of New York Athletic Conference (SUNYAC) wins this weekend, beating the College at Brockport and SUNY Geneseo to move to 16-4 on the year and 12-1 in the State University of New York Athletic Conference (SUNYAC). On Friday, Feb. 1, the Hawks traveled to Brockport and took on the Golden Eagles, winning 69-53. The battle waged throughout the first quarter, going back and forth between New Paltz and Brockport. A last second 3-pointer at 0:01 by Simon gave the Hawks an 18-16 lead heading into the second quarter. Struggling to sink a shot well into the second, the Golden Eagles gained as much as an eight point lead against the Hawks. 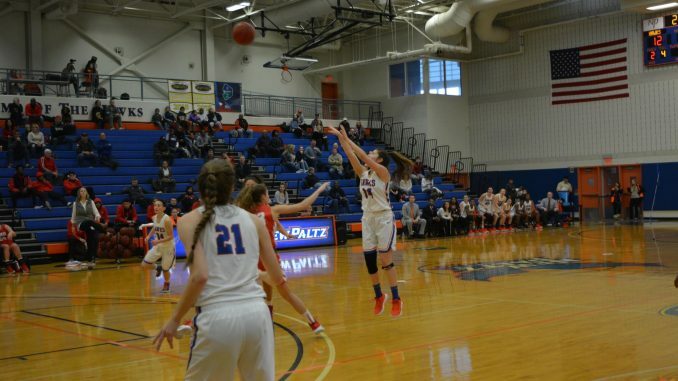 Third-year guard Marion Dietz netted New Paltz’s first points of the quarter with two free throws six minutes in, and soon after the Hawks went on a 9-0 run to end the first half, taking the lead at 29-28. In the third quarter, New Paltz took advantage of their slight lead and out-scored Brockport 26-13, giving them a 14 point cushion. Dietz sank three 3-pointers during the quarter, scoring a team-high 16 points in the third quarter alone. Going into the fourth, the Hawks built off of their lead and continued to dominate the court offensively, amassing a lead of as much as 19 with five minutes remaining. New Paltz’s bench closed the door, earning a 16-point win over the Golden Eagles. Dietz headlined the game on offense with 24 points, going 9-of-9 from the foul line. Fourth-year guard Rachel Simon and third-year forward Madison Van Pelt followed with 12 and 10 points, respectively. The Hawks managed to take home the win on Saturday, Feb. 2 against rival and reigning SUNYAC champion SUNY Geneseo, 73-64. The win moved New Paltz’s win streak to 12, with only one loss on the season in SUNYAC play. A well-scoring first quarter had the Hawks up 18-8 against the Knights. Simon scored 11 of the points, including a 3-pointer and two free throws putting the Hawks up by 10 at the end of the quarter. Geneseo fought its way back during the second quarter, going on a 9-0 run. With a layup by Van Pelt and a jumper and 3-pointer by Dietz to end the half, New Paltz went back up 29-21. The Hawks started the third-quarter with back-to-back 3-pointers from Simon and fourth-year guard Lindsay Bettke, increasing their lead to 10. The Knights fought back, and at the buzzer the scoreboard read 44-39. Buckets by Simon, Bettke and Dietz brought New Paltz’s lead back up to 12 midway through the final quarter. Geneseo brought the score to within nine four times in the final minutes, but a 15-of-17 performance on the foul line from the Hawks kept them in the lead. Simon led New Paltz offensively with 28 points, only 2 points shy of matching her career-high. Bettke followed with 20 points, three rebounds and three assists. The Lady Hawks face off against Buffalo State on Friday Feb. 8, and SUNY Fredonia on Feb. 9 on their home court.